Make every day a duvet day with the ‘Suvet’ suit. It’s the perfect office attire for people who struggle to get out of bed in the morning, allowing the wearer to experience 24/7 comfort, on the go. With Brits facing the prospect of an hour less in bed this weekend (the clocks go forward this Sunday, March 27), hotel chain Jurys Inn Hotel Group has come up with the perfect solution. The distinctive, bright-white two-piece suit has a snood-like padded collar, which handily doubles as a pillow. 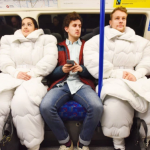 Plus, the over-sized shoulders are ideal for securing a little extra personal space on the morning commute. Your fellow travellers will be so envious. It will probably draw gasps of approval in the office too.